Launched in May 2015, the BMO AIR MILES World Elite MasterCard is the premier AIR MILES co-brand credit card from the folks at BMO! The card is very similar to the World version that has been around for a few years now but also comes with a few little extra features. The BMO AIR MILES World Elite MasterCard is one of many credit cards for AIR MILES collectors from BMO. This is for seasoned collectors or those who really want to make AIR MILES their primary program while having a card with great travel insurance and benefits.. The BMO AIR MILES World Elite MasterCard currently offers a 3,000 AIR MILES Reward Miles bonus when you apply for the card by November 30th. We value a AIR MILES Reward Mile in the $0.11 to $0.15 range when redeeming for travel which means the sign up bonus translates to rougly a $330 to $450 value. The BMO AIR MILES World Elite MasterCard has a $120 fee for the primary but no fee for secondary cards. The interest rate on the card is19.9% which is in line with most of the cards at this level. The BMO AIR MILES World Elite MasterCard earns 1 AIR MIlES Reward Mile for every eligible $10 spent on the card. This is the best earn rate of any AIR MILES co-brand card since it is on all spending. Several other cards do have 1 for $10 but only at AIR MILES sponsors or select merchant categories. Being a co-brand card, redemption is actually done via AIR MILES not via BMO. This is where the relative strength of the AIR MILES program comes through to make the BMO AIR MILES World Elite MasterCard worthwhile for some people as they can earn even more AIR MILES on top of credit card spend via the vast amount of shopping partners that the program has. AIR MILES offers numerous redemption options but of course based on the name, the primary redemption option which most people dream about are flights. Reality is however that roughly only 10% of redemptions in the program are for actual flights. The remainder are for other travel related redemptions (hotels, car rentals, attraction tickets), merchandise or AIR MILES Cash. The majority of AIR MILES Flight redemptions are on Air Canada or WestJet however they also offer flights on American Airlines, United Airlines, Alaska Airlines, Lufthansa, Alitalia, Calm Air, Canada North and Central Mountain Air at their lowest redemption levels. Other airlines are available but cost more AIR MILES than what is published on the AIR MILES website. Redeeming AIR MILES Reward Miles for flights nets an average return of 11 to 15 cents per AIR MILE Reward Mile. If you look at what this card's base earn rate of 1 Reward Mile for every $10 means you'll achieve a rate of return of 1.1% to 1.5%. The BMO AIR MILES World Elite MasterCard comes with a whole host of features and benefits, the majority of which are standard for cards of this level. It has the standard Travel Accident, Flight Delay and Car Rental insurance. The one insurance it does have that perhaps only about half of its competitors ahve is Trip Cancellation insurance. This benefits covers up to $2,500 per insured person to a maximum of $5,000 per account. The card also offers free Priority Pass membership which allows access to over 600 business class lounges Worldwide. Normally the pass costs $99 per year plus your entry fee into each lounge of US$27. The BMO AIR MILE World Elite also gives you two complimentary lounge access passes valued at a total of US$54. The final benefit, which many BMO AIR MILES World MasterCard holders are familiar with is the 25% discount on AIR MILES redemptions for travel within North America. This benefit used to be Worldwide before the launch of this card but was reduced on both World versions as BMO found that the majority of cardholders did not redeem for flights outside of North America due to the difficulty in earning the large mileage requirements to do so. The two best things about the BMO AIR MILES World Elite MasterCard are the current sign up bonus of 3,000 AIR MILES Reward Miles and the 25% discount on flights within North America. Having a full suite of travel insurance and lounge access benefits definitely make this card very valuable for those who are serious AIR MILES collectors and serious travellers. There really isn't too much that is not so good about this card. We are surprised they only offer 2 free lounge visits with the card when their proprietary BMO Rewards World Elite card offers double that. BMO could easily do the same with this card. Consumers looking to get some free flights by grabbing the card, getting the sign up bonus, redeeming with the 25% discount then divesting the card. For points collectors who are fully engaged in the AIR MILES program and have it as their primary loyalty rewards source the BMO AIR MILES World Elite MasterCard is strong contender to be your primary credit card. If you are really serious about the AIR MILES program your best is bet is to have this card and the American Express® AIR MILES®* Platinum Credit Card since it offers a 2,000 mile sign up bonus and no annual fee in the first year. The combination of the two cards make the earn and burn potential of AIR MILES ideal. If AIR MILES is a secondary program or not on your radar this card shouldn't be your first choice but with a large sign up bonus like this with no annual fee in the first year you could hack it and get the card just to get those miles and divest of it before the year is up. Otherwise there are other options that could be better for you. If you travel at least once a year, or are looking to rake in rewards as fast as you can and want the flexibility of being able to choose your travel dates, airlines and if and when you have stopovers a proprietary credit card program like TD Rewards, BMO Rewards or Amex's Membership Rewards would make more sense. Care to comment? Do you agree or disagree with us? 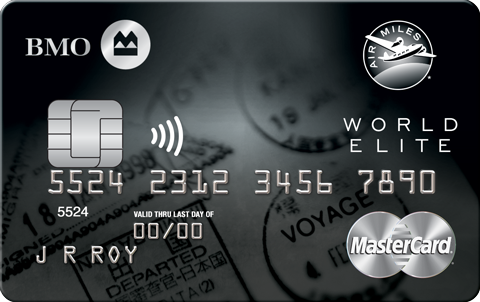 Tell us what think about the BMO AIR MILES World Elite MasterCard below!